Art has always needed a vehicle to push out its message and its meaning. In the early 70's a new breed of NY artists, took that concept literally! This was the beginning of subway art. been the same. This simple concept that creating art on vehicles to literally move your message around the city was brilliant! So much so, now corporations spend millions on buying billboard space on subways, buses, commuter trains and even the sides of high traffic highways all over the world. their canvas to include the corrugated metal sides of trains, buses, cars, freeways, etc. to recapture the beauty and expression of their urban environment. 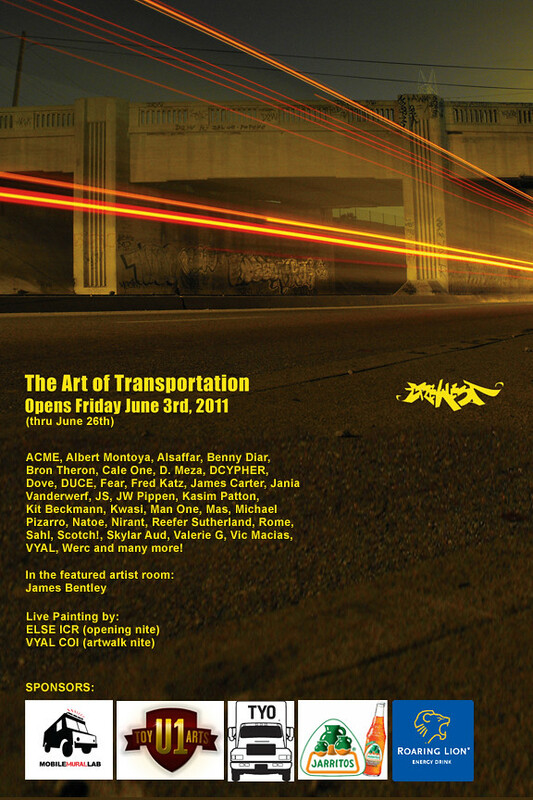 This exhibit will feature original paintings, photography, and even small scaled versions of trains, automobiles, and miniature freeway signs painted by urban artists. Also included in the exhibition are beautiful images of automobiles as art and the dialogue created when they are placed within a certain environment.